Be they grand or small, we invite your pets to share their opinions. While tiny dogs like the Chihuahua, Maltese and Yorkie are the first dogs that spring to mind when you think of dog clothing, in fact it can be difficult to find clothing that is made for dogs this small. Often times you have to buy puppy clothes instead of tiny dog clothes and there are differences. For example a Labrador puppy may be about the same size as a Chihuahua for a few weeks but his legs are going to be thicker and differently shaped. This means that while a puppy sweater may fit a Chihuahua it is going to be baggy around the legs. The reason a good fit is important is that tiny dogs often don't wear clothing just because their owner thinks it is cute. Small dogs get cold very easily and their clothing serves the purpose of helping them maintain body heat. This is why unless it is a very hot day you will most often see small dogs wearing at least a sweater when they go outside. So at least you know there is a reason to dress your tiny dog other than the fact that it is adorable. When looking for clothing for small dogs there is a lot of variety in the types of clothing you may want to get. If you find a dog clothing place that specializes in tiny dog clothing or does custom clothing you may want to stock up so you don't end up getting a puppy jacket that lets cold wind through. Tiny dogs will benefit from vests, hoodies, jackets, sweaters and even light t-shirts when in an air conditioned home. 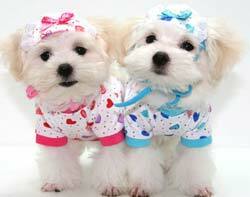 Many pet owners enjoy dressing their small dogs up in frilly and fluffy outfits that really show off their daintiness. This includes dressed, ballet outfits and more. Hats, raincoats and even tiny booties are available to keep your small dog warm. Dog clothing keeps up with the latest fashion trends so even your small dog can have a runway look when you go for a walk or visit the dog park. Because temperatures both indoors and out vary so differently you will want several degrees of warmth and coverage for your small dog. Some days it may need a sweater inside the house, other days it may need a t-shirt. Think of your small dog like a baby and think about how the temperature feels to it. Layering is not the best choice to keep a tiny dog warm; instead a variety of clothing will serve the purpose of keeping the dog warm whether it is a brisk fall day or a freezing winter day. Which breed of dog is exact for you? © 2010 animal-internet.com. All rights reserved.